In Windows 8 there are now two different versions of Internet Explorer 10 installed. One is a Metro looking version that does not support Brower add-ons to improved performance and reliability of the touch version of the browser. 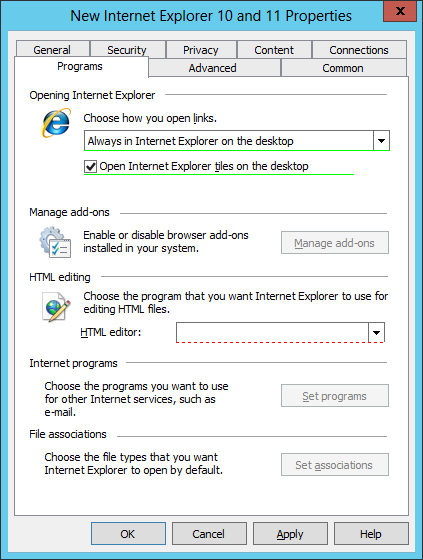 The other more traditional desktop version of Internet Explorer allows browser add-ons (x86 only) but its controls are not as touch friendly (for more info see http://blogs.msdn.com/b/b8/archive/2011/09/14/metro-style-browsing-and-plug-in-free-html5.aspx). However if you are using Windows 8 on a traditional non-touch device however you will pretty much want to always want to default to the IE Desktop version as there is no advantage to running the Metro version without a touch screen. 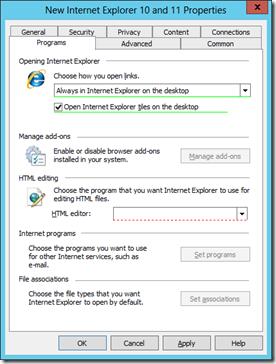 Along with the new browser there is of course new Internet Explorer 10 group policy preferences settings and one of these allows you to default the browser to always open in IE in desktop mode and below are the instructions you need to default the browser to Desktop Mode. Note: Not sure why it is called “Internet Explorer 10 and 11” but this seems to suggest that the options of the two browsers version will be similar. Just curious, why all the postings about Group Policy and Windows 8? Win 8 may be out in seven months. How about articles dealing with Server 2008, an OS we use now? Great question. There are currently a lot of how to articls about Windows 7 and below on the internet… Certainly this site has a lot of pre-Windows 8 topics as well. Windows 8 is defenilty a long time away from release however like anything it takes time for people to learn the new features of any new software…. My aim is to highlight what is new/different in Windows 8 so it can be used in conjunction with the other pre-windows 8 content. Hopefully this will also help people evaluate if the product has enough new features to justify the rollout of Windows 8.